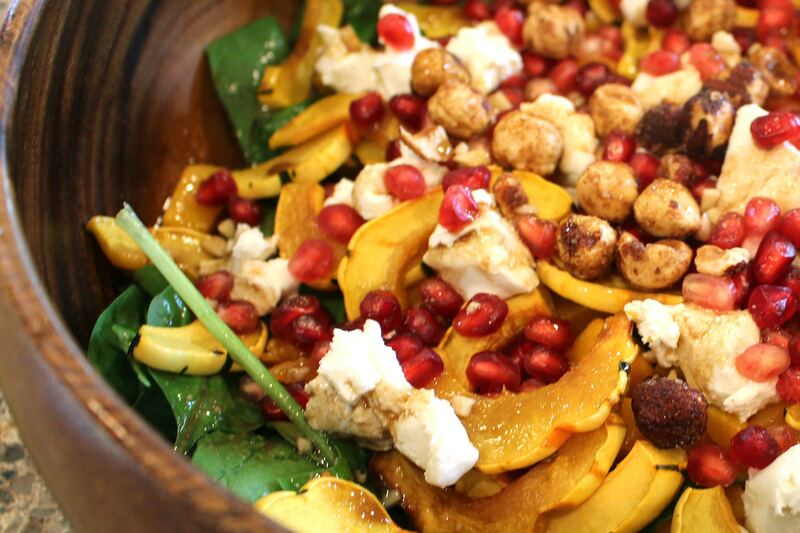 We love this healthy and filling squash salad with goat cheese, walnuts and pomegranates. Preheat the oven to 400 degrees Fahrenheit. Cut off both ends of the squash then cut the squash in half lengthwise. Scrape out the seeds and save for roasting if desired. If you're using a butternut squash, cut the squash into small cubes. Slice the delicata into thin slices. Bake on a large baking sheet for 20-25 minutes, or until lightly golden, stirring halfway through cooking. Allow to cool slightly. Meanwhile, make the dressing. Using a small bowl or jar, whisk together the garlic, Dijon, maple syrup and balsamic vinegar. While whisking, slowly drizzle in the olive oil. Season to taste with salt and pepper. In a large serving bowl, combine the spinach, goat cheese, pomegranate seeds and walnuts. Add the squash if it's cool (it can still be warm, you just don't want it to melt the cheese). Drizzle the dressing over the top and toss to combine.